Patron of: AIDS Patients, AIDS Caregivers, Youth, Vocations. A duke from the legendary Gonzaga family of Mantua, Aloysius Gonzaga was born to inherit great wealth and to rule alongside the best families of Europe. While still a teenager he defied his powerful father, renouncing his birth rite in order to become a Jesuit novice. Weak in physical health but living a strong interior life, he knew he would not live long. He happily accepted his destiny and put himself into the hands of the Virgin Mary. Despite his fragile constitution, he insisted on caring for plague victims during a particularly virulent outbreak quickly decimating the city of Rome. He fell ill and lingered for months fully knowing his fate. Because his life was cut short at such an early age, and because he understood both the caregiver and patient side of serious illness, he is invoked by those with AIDS as well as those who tend sufferers of that disease. His novena is written by himself, commending his future to the Virgin Mary who he had a strong devotion to. 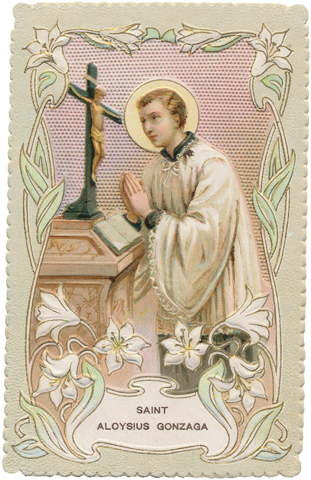 Though his father wanted him to be a great soldier, Aloysius Gonzaga was always a pious youth. He obediently served as a page in the Florentine court of Lorenzo de Medici and in the more auspicious Spanish noble court. Still, political ambition held no interest for him and he was appalled by the corruption and licentious behavior of the nobility. While in Spain he read a book about Jesuit missionaries in India and decided to join them for foreign missionary work. His father did everything in his power to prevent his son from giving up all his earthly privileges. When it appeared that Aloysius could not be persuaded away from the religious life, his family implored him to at least accept a higher office in the Italian church. Instead, he insisted on his birth rite being transferred to his younger brother and entered the Jesuit house of Sant’ Andrea in Rome as a lowly novice. The Jesuits found Aloysius too extreme in his devotions and forced him to eat better, mix with his fellows more, and to distract himself with physical recreation. As the plague swept Rome in 1591, the Jesuits opened their own hospital, forbidding Aloysius from working there due to his fragile physical disposition. As many of his brethren were felled by the illness, Aloysius threw himself into the role of caregiver with all his capabilities. No chore was considered too humble for him to do. He himself fell in March of that year and was given the last rites. He surprised everyone by recovering from that bout. Three months later, he was bedridden with a low grade fever. Though his condition seemed routine, he announced his impending death. Once again he was given the last rites and died during the prayers for the departing. Because of Aloysius Gonzaga’s personal inner strength at such a young age, he is called upon by teenagers at times of peer pressure. Since he knew exactly wanted to be as a teenager, he is also called upon by the young to help recognize an occupation or state of life. O holy Mary, my Mistress, into thy blessed trust and special blessing, into the bosom of thy tender mercy, this day, every day of my life and at the hour of my death, I commend my soul and body; to thee I entrust all my hopes and consolations, all my trials and miseries, my life and the end of my life, that through thy most holy intercession and thy merits, all my actions may be ordered and disposed according to thy will and that of thy divine Son. Amen. This entry was posted in Health and tagged help, Novena, prayer by sandra dipasqua. Bookmark the permalink.